The state of São Paulo is investing more to expand the urban rail network in the São Paulo metropolitan area, build light rail lines and introduce a two-line inter-city network in the state. Renata Passos reports on the progress made so far and the challenges facing the expansion. In addition to the president of the republic, Brazilians elected representatives of the federal and state legislatives including state governors in elections held at the end of the October. In São Paulo, the richest state in the country and with the largest rail transport network, Mr João Doria of the incumbent Social Democrat party, which has been in power for 24 years, was elected for a four-year term. Despite budget constraints following the recent economic crisis, railway development is one of the Doria government’s priorities and the administration is targeting expansion through public-private partnerships (PPPs). The new governor wants to accelerate work already underway on the São Paulo Metro and Paulista Metropolitan Trains Company’s (CPTM) suburban network, as well as execute new projects to expand capacity and modernise existing lines. The programme also proposes the construction of new light rail lines in major metropolitan regions outside São Paulo city and the introduction of an inter-city service between São Paulo, Campinas and Americana. Current work on the metro includes the extension of Line 5/Lilac. Nine stations were added in 2017 and 2018, two of which interconnect with Line 1/Blue and Line 2/Green, while a station at Campo Belo will open in early 2019 connecting with the future Line 17/Gold monorail which is also under construction. Concessions to operate these two lines were awarded to ViaMobilidade in August. Line 17/Gold will have eight stations in this first phase and will run from an interchange with CPTM Line 9/Emerald at Morumbi via Campo Belo on metro Line 5/Lilac to Congonhas station, near the airport of the same name, providing the first rail link to the city’s second airport. Operations are expected to start in 2020 following a six-year delay. However, this now looks doubtful. Last month, Scomi, the Malaysian company responsible for building the monorail trains, signalled that it wanted to leave the consortium. The manufacturer has yet to start construction of an assembly plant while it has transpired that the cost of the project has increased by Reais 2bn to around Reais 3.7bn. São Paulo Metro was planning to meet the ViaMobilidade consortium at the end of November to try to find a solution. The Airport Express provides a direct service five times per day, Monday to Friday, between Luz station and Guarulhos Airport with a journey time of around 35 minutes at a fare of Reais 8. The service travels over three CPTM lines: 11/Coral, 12/Sapphire and 13/Jade, with direct airport services coordinated with commuter trains. There is also a direct stopping service between Brás and Guarulhos Airport, which currently only operates in the early morning and early evening. A half-hourly service is also available, but passengers have to change between lines 12 and 13 at Engineer Goulart. The Temoinsa-Sifang consortium is currently manufacturing eight trains with luggage compartments for exclusive operation on Line 13/Jade, which are expected to enter service in the second half of 2019. Another project in the final phase of implementation is Line 4/Yellow, the first phase of which has been operated by the concessionaire ViaQuatro since 2010. The second phase comprises the construction of five stations, four of which have already been completed, the most recent being São Paulo-Morumbi in October. Line 4 is 11.3km long and has 10 stations between Luz and São PauloMorumbi. With the addition of this station, São Paulo now has a 96km six-line network with 84 stations. According to Pelissioni, only Vila Sônia station will be pending in 2020 and the second phase is budgeted at Reais 1.9bn. When completed, the 12.8km Line 4 should carry 893,000 passengers per day. Despite two stations opening on the initial 2.9km section in 2014, monorail Line 15/Silver had to wait four years for a four-station extension. The 4.7km link from Oratório to São Mateo opened in April this year and tenders are expected to be invited this month for a new contractor to complete work at four further stations as well as start work at Jardim Colonial. The contract will be signed in March 2019, with work commencing in April, and completion of the first station scheduled for October 2019. This new tender is necessary because many construction companies cannot obtain finance to continue the works following the national Operation Car Wash corruption scandal which has gradually enveloped an increasing number of Brazilian companies and politicians since 2014. According to Pelissioni, the metro’s new management is prioritising the completion of work on lines 4, 5, 15 and 17. In the case of CPTM, work is also set to resume on the 4.5km section of Line 9 from Grajaú to Varginha, which involves the construction of stations at Mendes-Vila Natal and Varginha. Work had been halted since the end of 2016 due to delays in the transfer of federal funds. A further Reais 945m is needed to build four road viaducts over the railway. “This is an important project as it serves a low-income peripheral region,” Pelissioni says. The extension is expected to open in 2020 and add 110,000 passengers to the 620,000 weekday passengers the existing 32.8km line already carries. As well as new projects, Pelissioni believes the new government should continue to modernise the existing metro and CPTM networks. He says improvements have been carried out and that two-thirds of CPTM’s 94 stations are now accessible to disabled passengers with all set to be accessible by 2020. The Reais 20bn inter-city rail project, which calls for the construction of a 477km regional network in São Paulo state, with trains operating at a maximum speed of 140km/h, is expected to get off the drawing board soon. The two lines will intersect in São Paulo and will serve 24 stations. 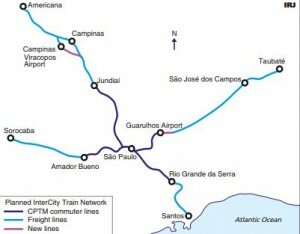 The north-south line will connect Americana with Santos while the eastwest line will run from Sorocaba to Taubaté. The network should directly and indirectly serve 173 cities and carry more than 170,000 passengers a day. The 135km section between São Paulo, Campinas and Americana is expected to be built first. Trains will use the same tracks as CPTM’s Line 7/Ruby between São Paulo and Jundiai. From there to Americana new tracks will be laid parallel to an existing freight railway. Pelissioni says the São Paulo – Jundiaí section will need additional tracks to enable fast inter-city trains to overtake much slower CPTM commuter trains. This will increase the cost of the project by Reais 5bn with the state contributing a third. Rail freight concessionaire Rumo supports the introduction of the intercity service between Jundiai and Campinas, because the line carries little freight traffic. However, this section does not have signalling and is unelectrified, so bi-mode electric-diesel trains are an option. It is a different story for the Campinas – Americana section as this line is heavily used by freight trains so investment in additional tracks would be needed. Another planned scheme is the extension of Line 2/Green from Vila Prudente to Penha on Line 3/Red in the east of the city. The estimated cost of the extension is Reais 6.5bn. 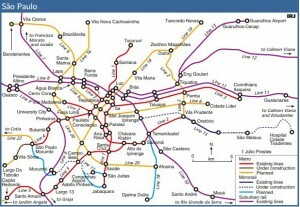 São Paulo Metro had obtained Reais 1.5bn from BNDES but decided to use the resources to complete Line 5/Lilac instead. Under a third stage, the idea is to extend the line north to the city of Guarulhos. These extensions will add 14km and 13 stations to Line2/Green, making it the longest metro line in São Paulo with a total length of 29km and 27 stations. Work is expected to start in 2021 or 2022. The contract to build the 14km Line 18/Bronze monorail from Tamanduateí south to Djalma Dutra, in the centre of São Bernardo do Campo, was awarded four years ago. However, the Vem ABC consortium was unable to start work because it did not have the necessary land, while the federal government lacked the required funds for the project as it was trying to reduce its debt burden. The plan now is to implement the Reais 6bn project as a PPP. The line will have 13 stations and is expected to carry around 320,000 passengers per day. Even when all these projects are completed, São Paulo will still require more lines to plug gaps in the network and tackle the city’s chronic road congestion and pollution. Tenders for an extension to the Baixada Santista light rail line, which connects Barreiros, in São Vicente, and the port of Santos, with 15 stations, were republished last month after the Court of Auditors suspended the bidding notice and requested changes to the tender. A public session for the submission of proposals from prospective bidders is now scheduled for December 13 at the headquarters of the Metropolitan Urban Transport Company (EMTU) in São Bernardo do Campo. The 8km extension with 14 stations will branch off the existing line at Conselheiro Nébias to serve the Valongo district in northern Santos. Work is expected to start at the beginning of 2019 and take two years to complete. A third 7.5km extension with four stations is also planned. It will link the Barreiros area to Samaritá in São Vicente, which has a population of approximately 120,000 inhabitants. These two extensions will expand the light rail network to 26km at a cost of about Reais 2bn. Sorocaba is also planning a light rail line, and five companies are bidding for a contract to carry out a study into its implementation, operation and maintenance. The line will run from George Oeterer, in Iperó, to the district of Brigadeiro Tobias. Between 150,000 and 200,000 passengers per day are expected to use the line. According to the City of Sorocaba, the 13km first stage of the project, scheduled to open in August 2020, will operate between George Oeterer and the centre of Sorocaba using an existing railway. A contract has been signed between the municipality of Sorocaba and Rumo allowing the municipality to operate LRVs on Rumo’s rail network. This will be the first time in Brazil that LRVs and freight trains will share the same tracks.